January 16 3pm PST: in AWCC world in Active Worlds was the Cy Awards, where Bruce Damer presented a keynote in-avatar at the AWCC/AWcommunity hosted awards. January 19 4pm: Bruce Damer presented a session "Cyberspace becomes a Place" at Human-Centered Computing Seminar, at the University of California Berkeley/SIMS, where this year's series is focuses on "Social Networks meets Computer Networks". Hosted by Profs. John Canny and Nancy Van House with special support by Dr. Barry Wellman. January 18-20 Was the 1999 Western Multiconference in San Francisco CA where Bruce Damer presented two papers, on TheU Virtual University and Nerve Garden at the VWSIM99 sub-conference on Wednesday January 20th, 8:30am -10:00am. Janurary 20-23 Was Medicine Meets VR in San Francisco, the foremost international conference on interactive technology in healthcare. This event often features virtual worlds, avatars and virtual humans. DigitalSpace participated in discussions to hold future events in virtual worlds. January 22 Expert Workshop - Was the Future of Identity in Cyberspace at the Institute for the Future, Menlo Park CA. NOTE: this event was not open to the public. A report will be given on this event by Richard Adler at VirComm '99, the Conference on Business-Based Virtual Communities. February 23-26 Was the VRML 99,the 4th International Conference on the Virtual Reality Modeling Language and Web 3D Technologies in Padeborn Germany which featured the DigitalSpace-produced world Avatars98 in a presentation at the Web3D Roundup and live webcast. March 5-7 Was CONTACT XVI, a unique conference bringing together anthropologists, space scientists, science fiction writers and others at the Biltmore Hotel and Suites in Santa Clara. On Saturday the 6th the Contact Consortium and DigitalSpace presented a special session on the Avatars98 experience as a large scale experiment in contact through DigitalSpace. 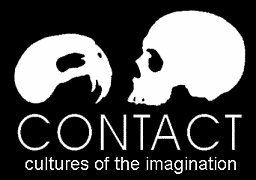 CONTACT COTI (Cultures Of The Imagination) is the grandfather origanization to the Contact Consortium. Special features this year were a day at NASA Ames exploring The Copernican Principle and featuring keynote speaker Greg Bear. March 22-23 Is theAAAI 1999 Spring Symposium Series on Artificial Intelligence at Stanford University where Bruce Damer will participate on a panel entitled "New Directions for AI in Interactive Entertainment and Art" and present Nerve Garden and other worlds and works of the Contact Consortium and DigitalSpace. See these pages for the program for AI and Computer Games. March 26 Is the Center for Integrated Facility Engineering (CIFE) 1999 Conference at Stanford University where Bruce Damer of DigitalSpace will present a session with Professor Renate Fruchter on the use of shared 3D virtual environments as process-based learning environments. April 26-27 Is VirComm '99, the Conference on Business-Based Virtual Communities in San Francisco California where on April 27th Bruce Damer of DigitalSpace and Bonnie DeVarco of the Contact Consortium will present a session onVirtual Tradeshows as an Extension of Communities covering the Avatars98 experience. In addition, later on the 27th Bruce Damer will present a special live tour session on Virtual Worlds and their Avatar Communities on the Internet. May 20-21 The first annual Virtual Worlds in Formal and Informal Education Workshop ("VLearn One") at the Cornell Theory Center at Cornell University, Ithaca New York. This event is sponsored by the Cornell Theory Center, UC Santa Cruz and the Contact Consortium's VLearn Special Interest Group. This event will be "worldcast" connecting many locations together through virtual worlds as was done with Avatars98. Contact Margaret Corbit if you would like to participate in this event. Consortium co-director Bruce Damer will present a special keynote session at the workshop at 1:30pm on the 20th of May. May 19-21 The TWLT 15 on Interactions in Virtual Worlds at the University of Twente in the Netherlands. The Parlevink project hosts a series of workshops on Language Technology, the TWLT series. The series of Twente Workshops in Language Technology (TWLT) aims at providing a platform for researchers in all fields related to language technology. Jan and Dirk de Bruin will present a paper co-authored by Bruce Damer and Stuart Gold "Steps toward Learning in Virtual World Cyberspace: TheU Virtual University and the BOWorld". June 7-9 Was the annual Institute for Robotics and Information Systems (IRIS) PRECARN IRIS 1999 Conference "From Virtual to Reality" in Toronto Ontaria Canada (the Regal Constellation Hotel) where Bruce Damer will give a dinner plenary and workshop on June 9th. Also on June 9th will be a Sector Focus Group (SFG) meeting on the topic of Virtual Reality. This event will occur in conjunction with the opening of The Virtual Environment TechnologiesCentre (VET) at London's (Ontario, Canada) Integrated Manufacturing Technologies Institute (IMTI). June 15-16 Was the High Wire conference for event planners in Monterey California. Bruce Damer and John Passalaqua will present a live demonstration session and workshop on creating tradeshows in virtual worlds on the net. July 8-10 DigitalSpace was involved in a presentation at the Sixth International Conference on Multi-Organizational Partnerships and Cooperative Strategy, TilburgUniversity, Holland. The paper is located here. July 20 Was the Reenactment and historical retelling of the Apollo moon landings and program with special guest Russel Schweickart, Apollo IX astronaut. August 8-13 Was SIGGRAPH 99 in Los Angeles CA where the Consortium presented the Apollo Reenactment Worlds at the Web3D Roundup. August 11-14 Was the CT'99: Cognitive Technology - Networked Minds Conference where the Contact Consortium and DigitalSpace presented a session with Michigan State University on cognitive issues in the use of networked virtual worlds. Nov 6-7 San Jose CA 1999: Was Digital Biota 3 at San Jose State University. Sign up on the OWorld or Biota mailing lists for updates on future Biota events. Bruce Damer presented an opening address and a special breakout session on DigitalSpace company projects and directions. Nov 5 Was ACM Multimedia International Workshop on Multimedia at the 7th International ACM Multimedia Conference in Orlando Florida.Jan de Bruin and Dirk-Jan de Bruin of the Contact Consortium and Virtual Worlds Consortium presented Virtual Organizations and Virtual Worlds, a Case Study of Avatars98. Bruce Damer and Stuart Gold from DigitalSpace co-authored the paper and presented remotely. Nov 6-7 Was futureScreen 99: AvAtArs | phantom agents at the Powerhouse museum in Sydney Australia. Active Worlds citizens and Contact Consortium members Merryn Neilson and Dave Rasmussen ( of DM3D Studios) and Miriam E will hosted a session "Have Avatar Will Travel" and remotely connecting in Bruce Damer and Stuart Gold of DigitalSpacefrom California. This event was produced by dLux Media Arts. Oct 30-Dec 4, 1999 Avatars99 Happened Click here for Reports Various dates from Was Avatars99, Colonizing Cyberspace, a truly millennial event in cyberspace! Sign up on the Avatars conference mailing list for next year's Avatars conference.